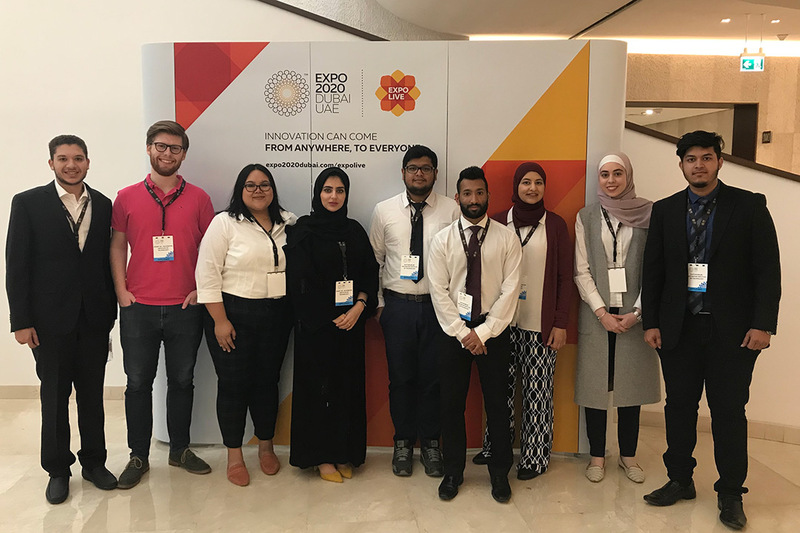 Two groups of RIT Dubai mechanical engineering students earned Expo Live University Innovation Grants to produce innovative ideas that help improve lives. Two groups of Rochester Institute of Technology Dubai mechanical engineering students earned grants to fund, accelerate and promote creative solutions that improve lives while preserving our planet. The University Innovation Grants were awarded by Expo Live, an innovation and partnership program launched by Expo 2020 Dubai. RIT Dubai students comprise two of the 28 groups to receive AED 25,000-50,000 in support from the University Innovation Program’s second cycle of funding. The awardees are expected to produce innovative ideas that help improve lives according to Expo 2020’s sub-themes of opportunity, mobility and sustainability. Team SustainabLEE is creating a compact home intended to be easy on the environment and optimize everyday living. The house is modelled to produce its own electricity using renewable sources including hydrogen fuel cells and solar energy. It will also be controlled and monitored by an artificial intelligence module that will study behavioral patterns. The students said the funding will help them purchase equipment including a hydrogen fuel cell, hydrolyzer and other sustainable materials. The team includes fourth-year mechanical engineering students Ronald Noronha of India, Yassin Ismail from Egypt, Abhishek Ghoshal of India and Adnan Khan of India. Team Smart 3D is designing and building a self-sustained manufacturing system that would combine a recycling mechanism, a 3D printing module and a renewable energy power source. The intent is to use it in remote areas that have limited access to resources such as electricity and plastic filament. The group of mechanical engineering students includes Sanaz Mokhtari, a fourth-year student from Iran; Kristine Bauzon, a fifth-year student from the Philippines; Rana Abdelsattar, a fifth-year student from Egypt; and Safaa Sadidden, a fifth-year student from Syria. The grants will not only enable the groups to take their ideas to the prototyping stage, but grantees may also get the opportunity to showcase their solutions during Expo 2020 Dubai. The expo aims to bring together more than 180 countries and millions of people to celebrate human ingenuity. To learn more about the Expo Live University Innovation Program, go to www.expo2020dubai.com/en/expo-live/University#university-innovation-programme.